Physicists at the University of Missouri (MU) have developed a new two dimensional material that offers some compellingly attractive qualities for use in electronic devices. The new material is magnetic and employs a unique honeycomb-like structure. Its distinctive electronic properties are such that it will be able to directly address two major issues in portable electronic devices today; battery life, and waste heat generation. Associate professor of physics and astronomy, Deepak K. Singh, explained the breakthrough. 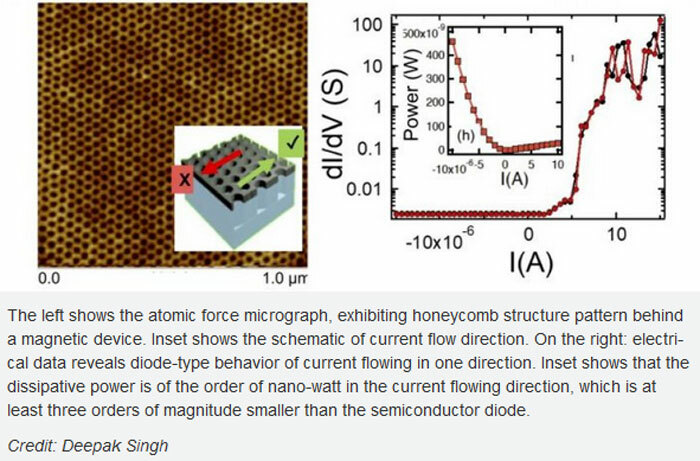 "Semiconductor diodes and amplifiers, which often are made of silicon or germanium, are key elements in modern electronic devices," Singh said, hinting at the new 2D material's most promising application. "A diode normally conducts current and voltage through the device along only one biasing direction, but when the voltage is reversed, the current stops. This switching process costs significant energy due to dissipation, or the depletion of the power source, thus affecting battery life. By substituting the semiconductor with a magnetic system, we believed we could create an energetically effective device that consumes much less power with enhanced functionalities." The new 2D material is significantly less power dissipative compared to traditional materials used in a semiconducting diode. When used in new magnetic transistors and amplifiers, the devices are thus more energy efficient. A key claim of the MU research paper is that thanks to the new 2D material - "designers could increase the life of batteries by more than a hundred-fold". The battery life claims are impressive but the new material and components made from it are also, remember, better as they minimise waste heat. Enthusiast PCs and laptops use a mix of large fans and esoteric cooling systems to run smoothly and maintain performance under duress. Interestingly the researchers talk about laptop or desktop CPUs using the new nanostructured technology to reduce waste heat - so it must be scalable. MU has applied for patents for its unique new 2D magnetic material and is said to be working to commercialise products, like diodes, based upon the advanced material. Probably have to wait for the patent to expire before these emerge in cheapo PSUs. I expect there will be substantial R&D, tooling and so on costs to recover before they get anywhere near plebs like us. Remember it's just the material and it still needs components designing around it so realistically there are going to be a lot of costs to recoup. What consumers want: batteries with 100x battery life. What companies will produce: much thinner and/or smaller batteries with equivalent life.